We’d love your help. Let us know what’s wrong with this preview of The Unconscious at Work by Anton Obholzer. Working in the human services has always been stressful, and the current massive changes in the organization of these services, together with dwindling resources and ever greater demands for cost effectiveness, add to the stresses inherent in the work. 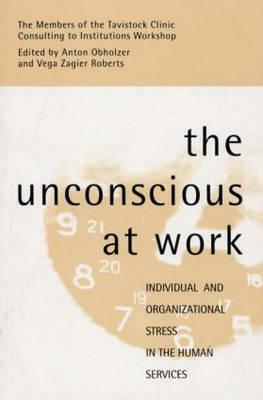 Even in the best run and best resourced organizations there are pockets of irrationality where unconscious institutional p Working in the human services has always been stressful, and the current massive changes in the organization of these services, together with dwindling resources and ever greater demands for cost effectiveness, add to the stresses inherent in the work. Even in the best run and best resourced organizations there are pockets of irrationality where unconscious institutional processes undermine both effectiveness and morale. The contributors to this book use ideas drawn from psychoanalysis, open systems theory, Bion's work with groups, and group relations training to explore the difficulties experienced by managers and staff in a wide range of care settings. Each concept is illustrated with examples from practice to make it recognizable and useful to the reader. To ask other readers questions about The Unconscious at Work, please sign up. Written in beautifully clear language that is pleasantly free of jargon. Had to read it as part of studies many years ago, but now choose to read it for its rewarding insights into organisational mindsets, and by extension the mindsets of individuals.